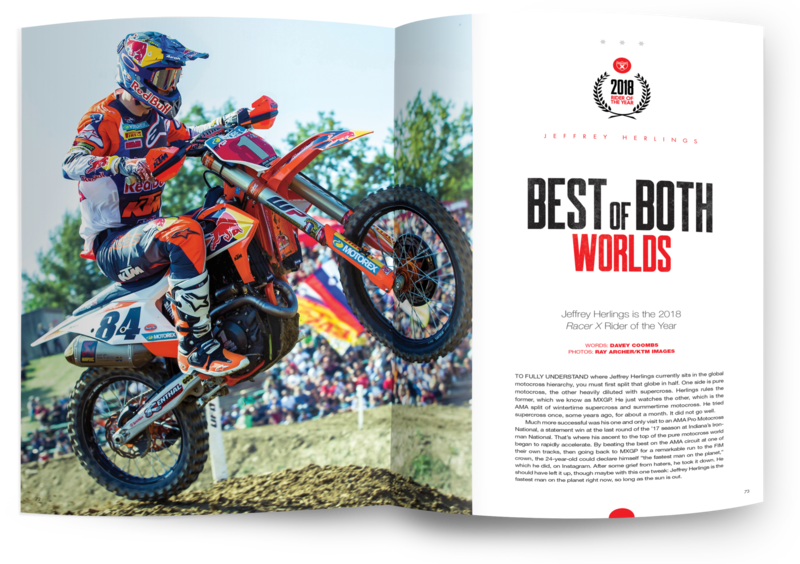 "Best of Both Worlds" is featured in the February 2019 issue of Racer X Illustrated. Subscribe now to read the entire article in full. You can pick up the digital edition and read this story right now—and the cost is just $9.98 for the whole year. To fully understand where Jeffrey Herlings currently sits in the global motocross hierarchy, you must first split that globe in half. One side is pure motocross, the other heavily diluted with supercross. Herlings rules the former, which we know as MXGP. He just watches the other, which is the AMA split of wintertime supercross and summertime motocross. He tried supercross once, some years ago, for about a month. It did not go well. Much more successful was his one and only visit to an AMA Pro Motocross National, a statement win at the last round of the ’17 season at Indiana’s Ironman National. That’s where his ascent to the top of the pure motocross world began to rapidly accelerate. By beating the best on the AMA circuit at one of their own tracks, then going back to MXGP for a remarkable run to the FIM crown, the 24-year-old could declare himself “the fastest man on the planet,” which he did, on Instagram. After some grief from haters, he took it down. 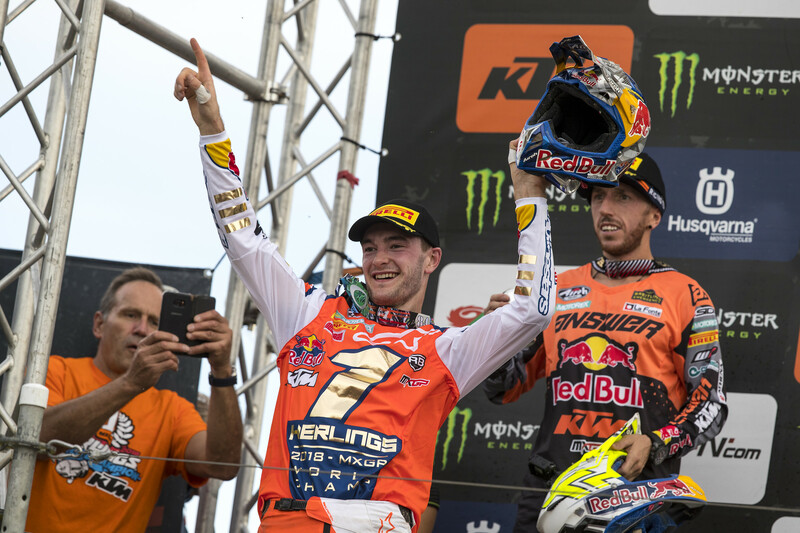 He should have left it up, though maybe with this one tweak: Jeffrey Herlings is the fastest man on the planet right now, so long as the sun is out. Herlings is having an easy November. After demolishing the competition in the 2018 FIM Motocross World Championship, winning 17 of the 19 MXGP races he entered and 33 of 38 motos (both records), he says he’s just been eating and “doing all of the things I shouldn’t be doing [during] the year.” That’s because Herlings is on the Aldon Baker program, albeit as something of a correspondent student. After years of being extremely fast but erratic, the Dutch prodigy decided to get more serious about training. He had to, because after demolishing the record books of MX2 Grand Prix racing, his long-awaited premier MXGP-class debut in 2017 got off to a slow start. He went into the season first with a wrist injury, then a broken hand just before the series opener. “I went to the first race, Qatar, and I really wasn’t healthy at all because I couldn’t train,” he explains. “I wouldn’t say I was fat, but I was definitely out of shape.” By the time he got both healthy and in better shape, the championship was already almost completely out of the question. So he made the decision to use an off-weekend before the MXGP of USA in Florida to race the season-ending AMA National in Indiana. He also used the fortnight in America to work closely with Baker and glean all he could.